Viktor Viktorovych Zinchenko Institute of Higher Education of the National Academy of Pedagogical Sciences of Ukraine. An existential-dialogical philosophy of education, mainly represented by O. Bollnow (modern «optimistic», «positive existentialism»), underlines the meaning and background of the pedagogical relationship in interpersonal relationships, the relationship between I and You. 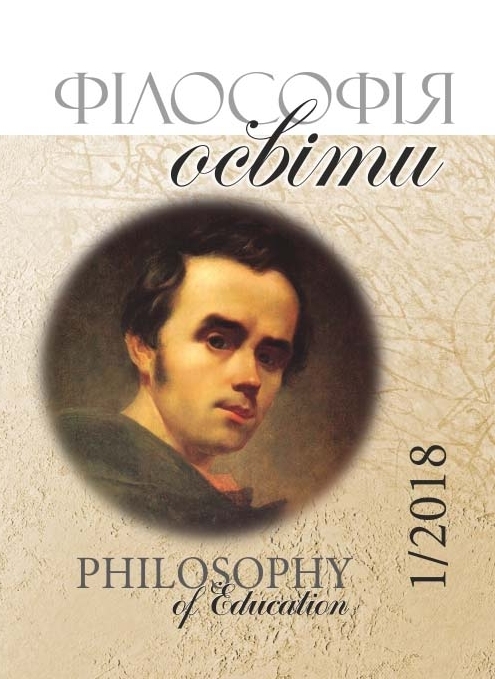 In its initial philosophical positions, it is based on the «philosophy of life» and mainly on existentialism both in the «classical» and «optimistic» versions. Supporters of this direction tend to discard the technocratic concepts which substitute for the process of education with the manipulation of person. Based on the thesis of uniqueness, the uniqueness of the individual, which is revealed in extreme situations, the supporters of this approach do not recognize the dominant role of the social environment in the formation of man. The environment, in their view, can only cause enormous damage to its moral self-development, since social institutions are aimed at the unification of personality and its behavior. Moral education, on the contrary, is intended to reveal the individual qualities and abilities of the individual, which will help to preserve the moral essence of the individual in the processes of knowledge acquisition, development of intelligence and in the education system. In the formation of a unique personality, the followers of irrationalism see an obstacle to totalitarian manifestations and dangers. In their opinion, the formation of a uniqueness, unique personality is nothing more than a process of self-development and self-education, which involves overcoming in human behavior «mass» trends, because the real education and education could not have their object exclusively in mass area. They see the tasks of education and upbringing as taking a unique personality away from the mass, «collectivist society» as a source of «false existence». But the closure of the process of education/upbringing on a separate subject, its isolation from social ties and relations dramatically limits the real possibility of forming an active personality, although the adherents of this approach proclaim this one of the main goals of education. In addition, the self-isolation of the individual increases its alienation in the world, making it increasingly vulnerable to the anti-human tendencies of global society. Viktor Viktorovych Zinchenko, Institute of Higher Education of the National Academy of Pedagogical Sciences of Ukraine. Doctor of philosophical sciences, professor, Head of the Department of internationalization of higher education, principal researcher of the Institute of Higher Education of the National Academy of Pedagogical Sciences of Ukraine. Bloch, E. (1993). Das Prinzip Hoffnung. Frankfurt am Main: Suhrkamp. Bloch, E. (1987). Subjekt-Objekt. Erläuterung zu Hegel. Frankfurt am Main: Surkamp Verlag. Bollnow, О.F. (1947). Einfache Sittlichkeit. Göttingen: Vandenhoeck & Ruprecht. Bollnow, О. F. (1965). Französischer Existentialismus. Stuttgart: W. Kohlhammer. Bollnow, O.F. (1966). Kriese und neuer Anfang. Beiträge zur Pädagogische Anthropologie. Heidelberg: Quelle &Meyer. Bollnow, O.F. (1962). Maß und Vermessenheit des Menschen. Göttingen: Vandehoeck & Ruprecht. Bollnow, О.F. (1979). Neue Geborgenheit. Das Problem einer Überwindung des Existenzialismus. Stuttgart, Köln: Kohlhammer. Bollnow, О.F. (1982). Studien zur Hermeneutik (Zwei Bande). Band 1: Zur Philosophie der Geisteswissenschaften. München: K. Alber. Göbler, Н.P., Lessing, Н.U. (1983). Otto Friedrich Bollnow im Gespräch. Freiburg/ München: Schweizer Verlag. Marcuse, H. (1993). Kritik der reinen Toleranz. Frankfurt a. M.: Suhrkamp Verlag. Motschmann, К. (2001). Herrschaft der Minderheit. Die verratene Basis. München: Wirtschaftsverlan Langen/Müller/Herbig. Morita, T. (1983). Zur Bollnow – Reception in Japan. Padagogische Rundschau, 6(37), 623-627. Sintschenko, V. (2017). Globale Transformationen der Gegenwart, Band 1, Systemischen globale Transformation. Saarbrücken: Palmarium Academic Publishing. Zinchenko, V.V. (2016). Internationalization of the education system and reform of higher education management: the German model. Osvitolohichnyy dyskurs, 3 (15), 74-96. Zinchenko, V.V. (2015). Models of Educational Philosophy in International Forms of Education management. Specificity of the Continental European Educational and Scientific System. Filosofiya osvity. Philosophy of Education, 2(17), 153-181.